A one-of-a-kind electric console guitar – the Grand Letar – is on display at Krannert Center for the Performing Arts during ELLNORA: The Guitar Festival. The guitar was designed and played by Letritia Kandle, a steel guitar performer in Chicago in the 1930s and 1940s. It was acquired by the University of Illinois’ Sousa Archives and Center for American Music in 2016. CHAMPAIGN, Ill. — A one-of-a-kind electric console guitar created by steel guitar performer Letritia Kandle in the 1930s will be demonstrated and on display at ELLNORA: The Guitar Festival. The Grand Letar is a five-necked, 26-string instrument that sits inside a console. 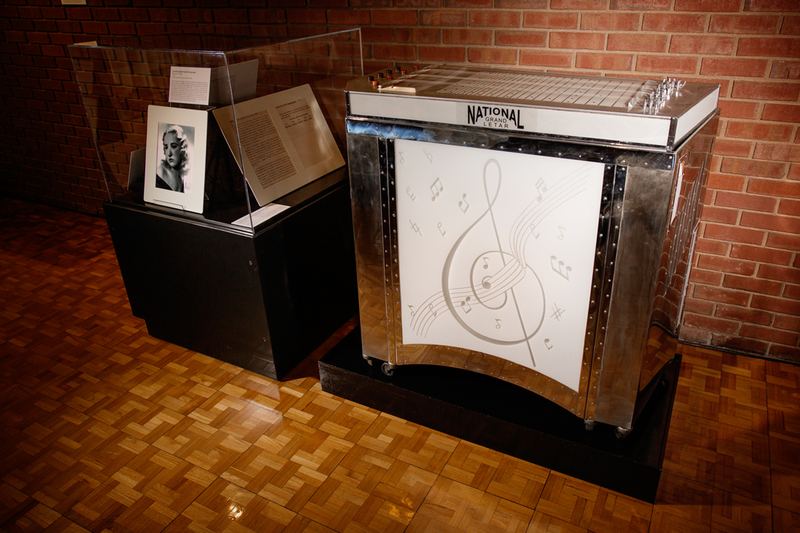 It was built in 1937 for Kandle, a Hawaiian steel guitar player and teacher from Chicago, and was acquired in 2016 by the University of Illinois’ Sousa Archives and Center for American Music. A free lecture and demonstration of the instrument will take place at 1:15 p.m. Sept. 15 in the Foellinger Great Hall at Krannert Center for the Performing Arts, as part of the ELLNORA festival. The event also continues the ELLNORA tradition of celebrating female guitar artists. The Grand Letar was envisioned and designed by Kandle so she could stand and play it, and was built by her father, Charles, and National Guitar, said Scott Schwartz, the director and archivist for the Sousa Archives. The instrument consists of a top cast in aluminum with the five string necks, sides made of wood and covered with chrome-plated steel, and a glass top and side panels. Inside the glass panels is a network of 120 colored lights controlled by a unique electronic flywheel mechanism that displays a kaleidoscope of colors as the instrument is played, Schwartz said. 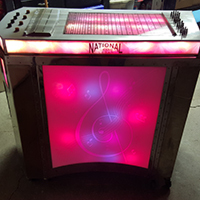 There are 120 colored lights inside the console of the Grand Letar guitar that flash while the instrument is played. Kandle premiered the Grand Letar while playing with the Paul Whiteman Orchestra in 1937 at the Drake Hotel in Chicago. National Guitar had Kandle demonstrate the instrument at the 1937 National Music Trade Convention in New York City. Because the instrument and its travel case weigh nearly 400 pounds, it did not prove practical to transport to concert performances and wasn’t mass-produced. National eventually developed a smaller version, without internal amplification and the light display, that Kandle played more frequently, Schwartz said. In addition to the Letar instruments, Kandle also played National Resophonic guitar and electric laptop and double-neck steel guitars with the Kohala Girls, an all-female group she formed that played Hawaiian steel guitar music in the Chicago area throughout the 1930s and 1940s. She also directed a 49-piece ensemble, the Chicago Plectrophonic Orchestra, that featured acoustic and electric guitars and lap steel guitars, mandolins, banjos, accordion, string basses, percussion and theater organ, Schwartz said. Also a well-known guitar teacher, Kandle died in 2010. Paul Warnik, a Chicago-area steel guitar collector and historian, met Kandle 10 years ago and became friends with her. She eventually gave him the Grand Letar, as well as papers and photographs that documented her career. 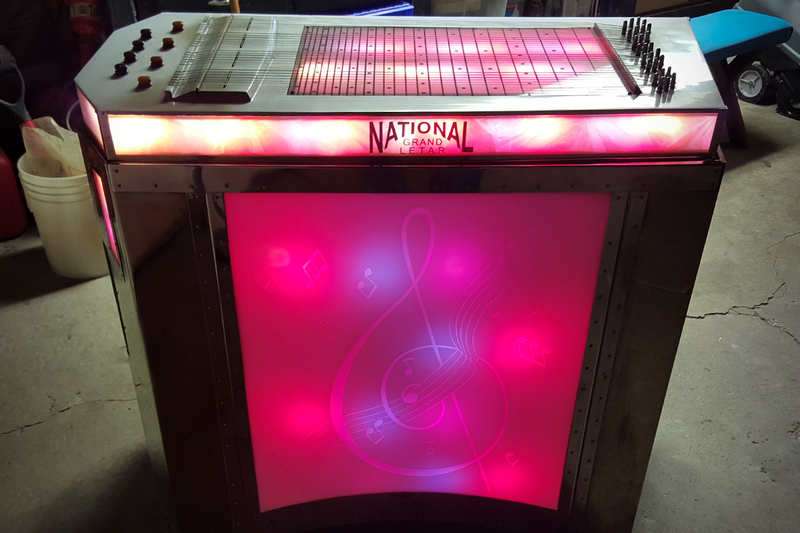 Warnik restored the Grand Letar and showed it at the 2008 International Steel Guitar Convention in St. Louis before donating it and the other memorabilia to the Sousa Archives. Warnik will talk with Schwartz at ELLNORA about Kandle and her career, as well as the evolution of steel guitar playing and his restoration of the Grand Letar. T.C. Furlong, a musician whose company provides sound assistance for ELLNORA, will demonstrate the instrument. The guitar will then be moved to the ELLNORA Store in Krannert Center’s lobby, where it and the other Kandle memorabilia will be on display for the remainder of the festival. Editor’s note: To reach Scott Schwartz, email schwrtzs@illinois.edu. For more information about ELLNORA, go to ellnoraguitarfestival.com or contact Bridget Lee-Calfas at bklee@illinois.edu.